View cart “LOVE OUTLOUD paperback” has been added to your cart. 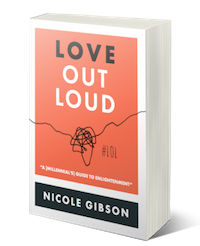 Love Out Loud [A Millennial’s Guide to Enlightenment] the eBook, is Nicole Gibson’s highly anticipated debut book. After 7 years of working closely with over 250,000 individuals as a CEO, facilitator, speaker, and Commonwealth Commissioner, Nicole, now 25-years-old, has put her life’s work into a beautifully crafted book. 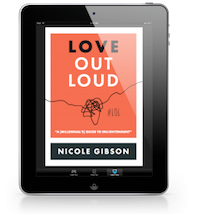 Love Out Loud mixes personal narrative with new frames of thinking designed to take you on a journey to realise your humanity, interconnectedness, and the truth of your nature. The book is a Millennial’s take on emotional awareness and spiritual growth, helping you create your own map back to love.